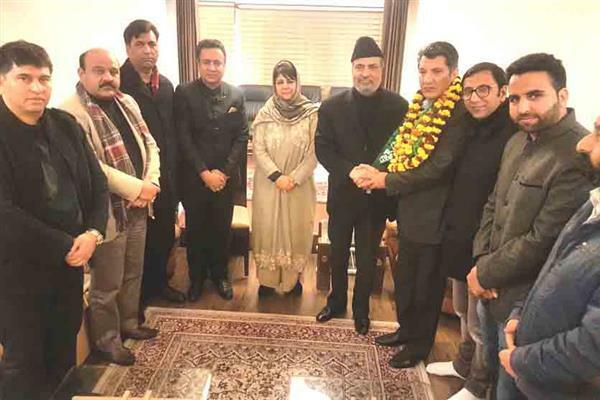 Jammu, Feb 02 (KNS): Former Jammu and Kashmir Teachers Forum (JKTF) president Abdul Qayoom Wani on Saturday joined Peoples Democratic Party (PDP) in Jammu and was welcomed by PDP President Mehbooba Mufti and Party Patron Muzaffar Hussain Beigh into the party fold. Hailing Wani’s services as a Trade Union leader, PDP President Mehbooba Mufti said that he has always represented the unrepresented in the power corridors of the state and remained in the forefront throughout his career to highlight the hardships faced by the state's working class. Mehbooba also declared Wani as party’s candidate from Baramulla for the forthcoming parliament polls slated to be held in April this year. Wani while addressing the press soon after joining the party stated it was the vision of the PDP that inspired him to join the party and become part of the caravan which is striving on all fronts to get the state out of the squalid conditions and make peace and prosperity permanent in Jammu and Kashmir. “The Confidence Building Measures taken by the PDP founder Mufti Mohammad Sayeed like ending of the Ikhwan era, talks with Hurriyat and opening of the Muzzafarbad route are enough to make one understand the pro-people policies of the PDP and why every peace-loving citizen of the state is duty bound to strengthen the party on ground,” Wani said. He added that the basic reason for him to join the party is to strive for fulfilling the PDP’s mission and make strenuous efforts in stopping the vicious cycle of violence which is consuming state’s younger generation with each passing day.